Note: Some consider the conditional to be a "mood." Others consider it to be an indicative tense. As the name implies, the conditional is a verb conjugation used when some action is based upon some condition or somehow contingent on something else. This corresponds to the English use of the word "would." For example, "What would you do?" "I would leave immediately." 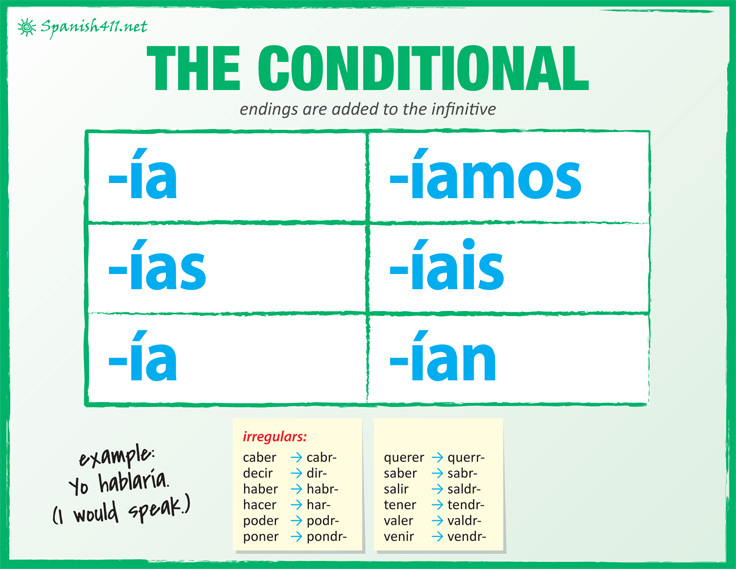 The conditional conjugations closely parallel those of the future tense. Note: Because the yo and él/ella/Ud. forms are identical, it's a good idea to include a subject pronoun if the subject isn't clear. If those endings look familiar, they should. They're exactly the same as the imperfect "-er" / "-ir" verb endings. How can different tenses have the same endings? Remember that here we're adding them to the whole infinitive, not just the stem. Nosotros trabajaríamos por tanto dinero. We would work for that much money. Tú entenderías más que yo. You would understand more than I (would). Notice that the English translations include the word "would" or a contraction of it. Let's practice! Conjugate regular conditional verbs on ¡Practiquemos! Note: The verb haber is also irregular in the conditional. It becomes habría which means "there would be." Note: The verb satisfacer (to satisfy) follows the pattern of hacer: satisfaría, satisfarías, etc. Pay special attention to querer. The imperfect form of querer is "quería." The conditional form is "querría." Notice the difference? The only difference between saying "I wanted" and "I would want" is a rolled "r."
Él tendría que estudiar mucho. He would have to study a lot. No podrían correr tan rapidamente. They wouldn't be able to run that quickly. Note: The verb bendecir (to bless) does not follow the pattern of decir: bendeciría, bendecirías, etc. I would never oppose her. Los cambios prevendrían problemas financieros. The changes would prevent financial problems. Let's practice! Conjugate irregular conditional verbs on ¡Practiquemos! When should you use the conditional? The primary reason is to discuss hypothetical situations that may or may not yet occur. These situations are contingent upon some other condition or situation. I would finish my homework. Note: The conditional is also known as the "hypothetical future." Con más tiempo yo terminaría mi tarea. With more time I would finish my homework. Yo terminaría mi tarea pero no tengo tiempo. I would finish my homework but I don't have time. Yo terminaría mi tarea si tuviera más tiempo. I would finish my homework if I had more time. The Imperfect Subjunctive: how?, The Imperfect Subjunctive: when? If you're wondering about the tuviera, it's an imperfect subjunctive conjugation that you probably haven't learned yet. You can learn all about it by reading The Imperfect Subjunctive: how? and The Imperfect Subjunctive: when?. She was probably studying yesterday. / She would have been studying yesterday. Ellos caminarían más de cinco millas. They must have walked more than five miles. Pienso que regresarán en una hora. I think that they will return in one hour. Pensaba que regresarían en una hora. I thought that they would return in one hour. Ella dijo que traería las bebidas. She said that she would bring the drinks. ¿Podrías traerme un vaso de agua? Podrías and gustaría are used here instead of puedes and gusta in order to sound a bit less demanding. I would watch TV on Saturday mornings. Yo miraba TV los sábados por la mañana. Not: Yo miraría TV los sábados por la mañana. For a presentation of the conditional, use the Verb Demonstrator.